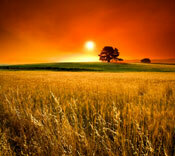 It is now high summer and the union of Sun and Earth, of God and Goddess, has produced the First Harvest. 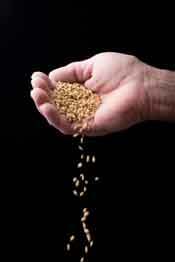 Lammas is the celebration of this first, Grain Harvest, a time for gathering in and giving thanks for abundance. We work with the cycle that Mabon or the Autumn Equinox is the Second Harvest of Fruit, and Samhain is the third and Final Harvest of Nuts and Berries. The word 'Lammas' is derived from 'loaf mass' and is indicative of how central and honoured is the first grain and the first loaf of the harvesting cycle. It is also the great festival of Lugh, or Lug, the great Celtic Sun King and God of Light. August is His sacred month when He initiated great festivities in honour of His mother, Tailtiu. 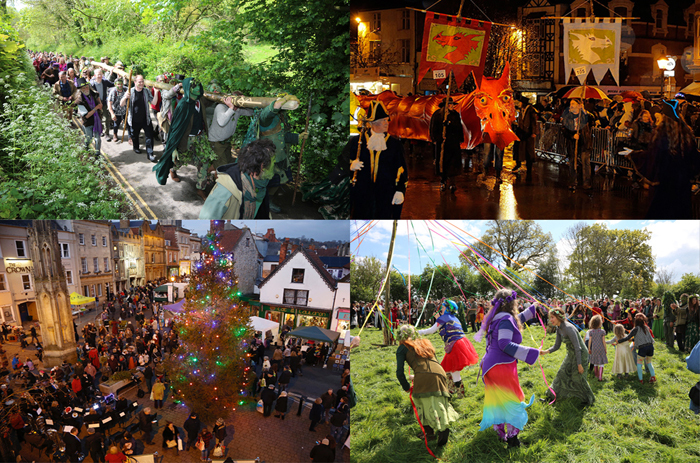 Feasting, market fairs, games and bonfire celebrations were the order of the day. Circle dancing, reflecting the movement of the sun in sympathetic magic, was popular, as were all community gatherings. August was considered an auspicious month for handfastings and weddings. So as the grain harvest is gathered in, there is food to feed the community through the winter and within that harvest is the seed of next year's rebirth, regeneration and harvest. 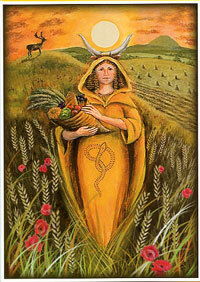 The Grain Mother is ripe and full, heavily pregnant she carries the seed of the new year's Sun God within her. There is tension here. For the Sun God, the God of the Harvest, the Green Man, or John Barleycorn, surrenders his life with the cutting of the corn. 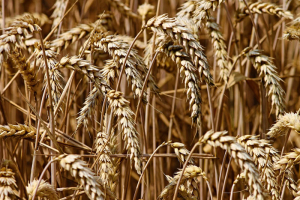 There are many customs throughout Europe around the cutting of the grain or corn and they applied to all cereal crops including wheat, barley, rye and oats. Both the cutting of the first gain and the last grain are significant. The first sheaf would often be ceremonially cut at dawn, winnowed, ground and baked into the Harvest Bread which was then shared by the community in thanks. The first barley stalks would be made into the first beer of the season. The first sheaf guarantees the seed and thus continuity. The last sheaf was also ceremonially cut, often made into a 'corn dolly', carried to the village with festivity and was central to the Harvest Supper. The corn dolly was made into a Corn Maiden (after a good harvest) or a cailleach, hag or cone (after a bad harvest). She could be dressed with ribbons, even clothed. This last sheaf would live in the home, often above the fireplace or hearth of the home, until the next harvest. Or it might be placed in the branches of a tree or mixed with the seed for the next year's sowing. In some way it eventually needed to return to the earth from whence it came so that the fertilizing spirit of John Barleycorn, of the Harvest God, could pass from harvest to harvest. It could be ploughed back, returned to decay and rot, or burnt and the ashes scattered. In some parts of Europe the tradition was to weave the last sheaf into a large Corn Mother with a smaller 'baby' inside it, representing the harvest to come the following year. Once the harvest was completed, safely gathered in, the festivities would begin. 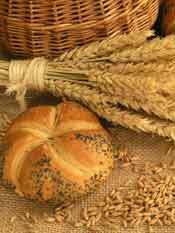 Bread was made from the new grain and thanks given to the Sun's life-giving energy reborn as life-giving bread. wheat, barley, oats, rye, all representing both fulfillment and potential. Also known as Queen-Of-The-Meadow, Bridewort and Bride of the Meadow. One of the most sacred herbs of the Druids, this was often worn as a garland for Lammas celebrations and was a traditional herb for wedding circlets and bouquets at this time of year. Also used for love spells and can be strewn to promote peace, and its heady scent cheers the heart. Mint is another of the three most revered herbs of the Druids (vervain being the third, according to Grieve). 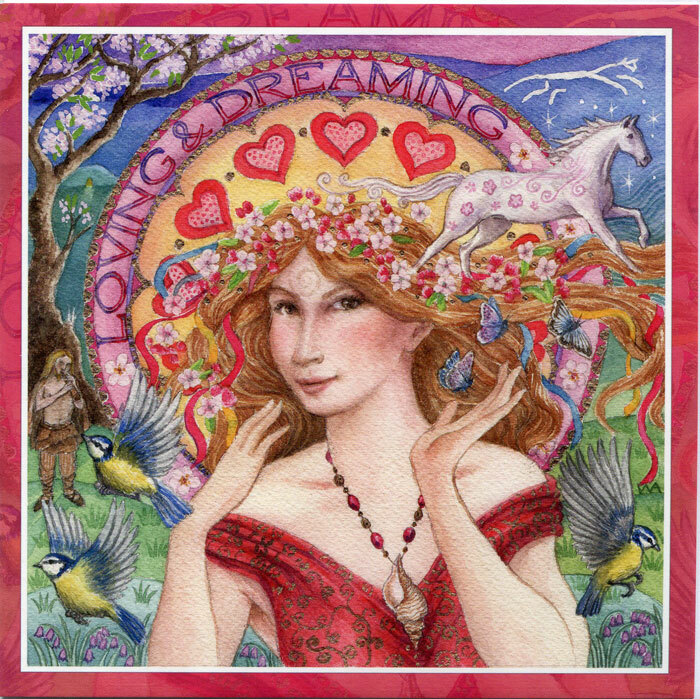 Its magical properties are both protection and healing, and at this stage in the year, its properties of drawing abundance and prosperity, are most appropriate. Sunflower. We take sunflowers for granted, they are perfectly named and loved by children of all ages. By this stage in the year the flower heads are full and heavy with that wonderful spiral of seeds and they spend the whole day gently turning their heads to gaze at the sun. In the Aztec temples of the sun, priestesses carried sunflowers and wore them as crowns. They symbolize the fertility of the Solar Logos. Calendula. Little suns, pure joy, in all their shades from deep orange to pale yellow. Still green, with every shade of sun and harvest, from gold and yellow to deepest orange. Wheat and all grains, corn dolly, bread, sunflowers and calendulas (pot marigolds).
. Don't worry if it isn't a traditional besom, any broom will do as it is always intent that is important. If you have no broom collect a bundle of twigs and tie them at the top with Lammas ribbon to make a hand broom shape. The besom/broom is a potent symbol of hearth and home, found in some form in almost every household. It is a traditional magical tool useful for everyday charms as it has the imprint of its owner firmly on it. Sweeping is a natural gathering gesture. A piece of green ribbon (for abundance), a piece of gold ribbon (for prosperity and gathering) or ribbon in Lammas harvest colours would be equally suitable. Ideally a sprig of mint from your garden (but you can get this from any supermarket), or dried mint - put it in a pouch. The mint represents abundance and plenty and is easily accessible to the urban hedgewitch. "By one, two, three and four, sweep Lammas gifts to my door. May abundance be a constant friend, by my hearth till Winter's end." Repeat this three times, then take your besom/broom back into your house and put it in its usual place. You can leave the ribbon on for as long as want to, for a lunar month, or until winter is done. If you have made your own broom you can place it where you consider the heart of your home to be. The mint can be returned to the earth with thanks. 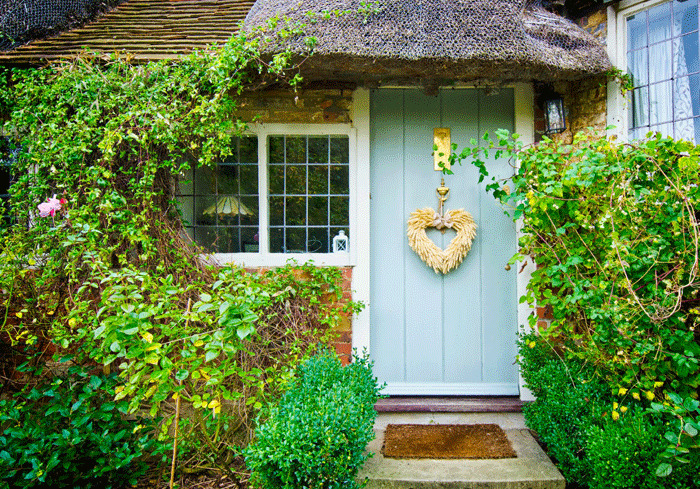 If you do not have an outside space you can sweep from your front door inwards to either your kitchen or hearth using the same charm. Sprouted seeds - these represent regeneration. Can even be bought in the supermarket now. Frequently found in wholefood shops - or sprout your own. Place the flour in a large bowl. Make a well in the centre. Sieve in the blended salt and soda and pour in the buttermilk. Mix well with a wooden spoon until the dough feels springy and then mix in the sprouted seeds. If it feels too sloppy just add a little more flour. Turn it onto a board and cover with a fine dusting of flour. Pat it with your hands until you have a round shape. Take a sharp knife and score lightly into eight sections, one for each festival. Our picture shows the bread cut into five sections, making a pentacle. Place onto a greased baking tray and pop your buttermilk bread into a moderate oven for about 20-25 minutes. Keep and eye on it. When the bread is ready it will change colour and it will sound hollow when you tap the bottom. Cool completely on a wire rack. When it is cool, tie it with Lammas ribbon. Take time to concentrate on the bread you have created and turn the loaf three times saying"From the fields and through the stones, into fire, Lammas Bread, as the Wheel turns may all be fed. Goddess Bless." Involve children if you can. Collect and dry them in the sun, ready for next year's planting. Consider giving them as gifts at Samhain or Yule. Seeds are such amazing and mysterious things - each tiny seed contains within it the blueprint for the whole plant it will become. It will mirror its mother plant, the mother that raised the seed and returned it to the earth with the help of the light of the sun. It's a miracle every time. Have Fun, Give Thanks and Celebrate.